Eduard Shevardnadze (Georgian: ედუარდ შევარდნაძე; Russian: Эдуа́рд Амвро́сиевич Шевардна́дзе, tr. 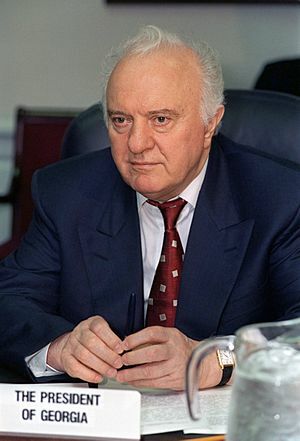 Eduard Amvrosiyevich Shevardnadze; 25 January 1928 - 7 July 2014) was a Georgian politician. He was a former Soviet minister of foreign affairs. He served as President of Georgia from November 1995 to November 2003. Eduard Shevardnadze Facts for Kids. Kiddle Encyclopedia.